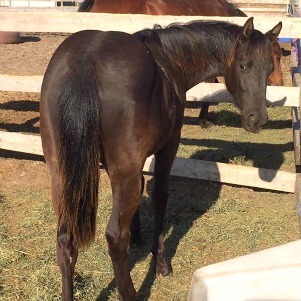 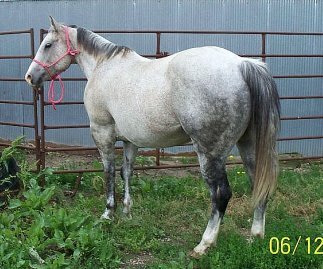 WE HAVE HAVE HAD SEVERAL TYPES OF HORSES PONIES,QUARTER HORSES,CROSSES,GRADES,ARABIANS AND EVEN A COUPLE OF APPALOOSA'S & EVEN A THOROUGHBRED.I OBVIOUSLY CAN'T POST PICTURES OF ALL OF THEM!! 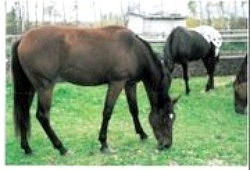 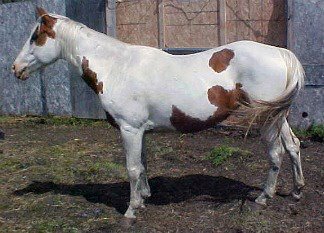 SO THESE ARE THE HORSES WE HAVE HAD SINCE WE MADE THE SWITCH FROM ARABIANS TO PAINT HORSES IN 2003-THERE HAVE BEEN A COUPLE OF UN-REGISTERED HORSES. 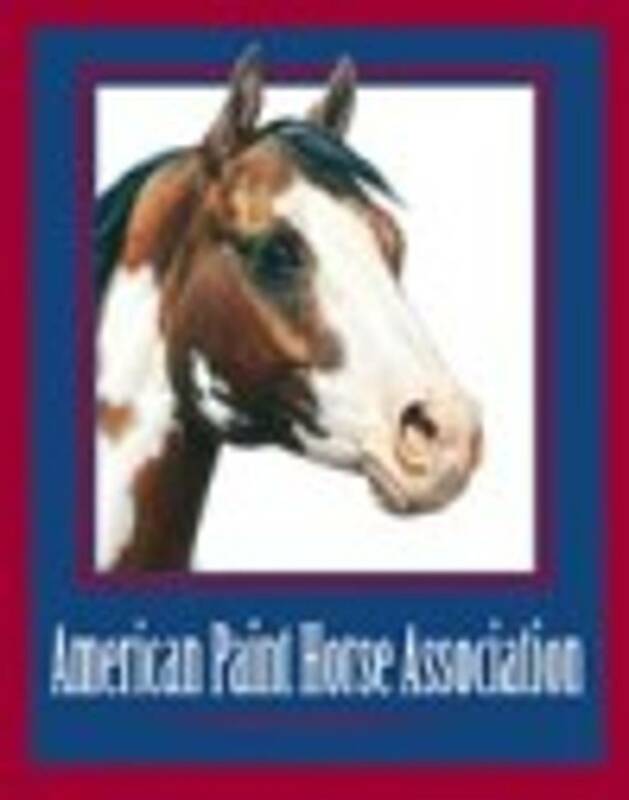 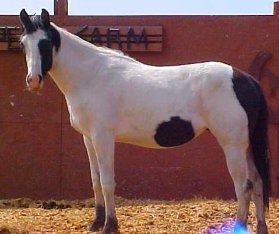 *THE REST WERE REGISTERED WITH THE AMERICAN PAINT HORSE ASSOCIATION AND WITH THE NATIONAL PINTO HORSE REGISRTY AND AMERICAN QUARTER HORSE ASSOCIATION. 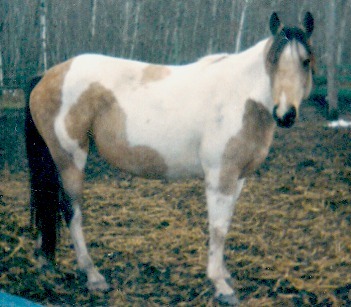 Patches a 1995 Bay Tobiano mare of unknown breeding.I only owned her for about 3 months before I gave her to friend of mine who wanted a nice quiet horse.Patches was headed to auction and was lame on top of it so i said i would take her,i thought she was way to nice for that and was concerned who would end up buying her due to her lameness.I new she was well saddle broke and had great manner's and never considered her for breeding due to her age,she was 14 y.o when i acquired her and lameness was a big issue for her which is why she was auction bound in the first place.This mare is now sound due to good care and good owner's and is being ridden regularily & being used as a lesson horse.Although we never had her in our broodmare band she is a very good looking mare and probably would have thrown nice foals.Patches was sold & now lives outside of Anola,Mb. 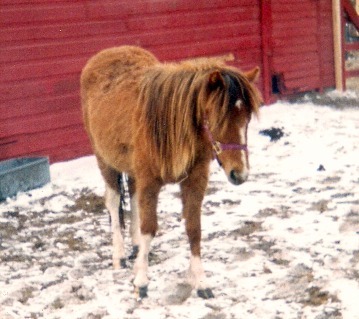 Miss Magoo aka Gooey a 2000 Bay Shetland/Mini cross pony mare.This little mare was very sweet & cute as you can tell from her picture.We were going to hang on to her when we had our arabian stallion because he was a small stallion,but then we bought Spike and changed to strictly paints.We only advertised her for sale for 3 or 4 days when a family bought her for their daughter who re-named her Princess and was riding her fairly quickly after getting her.Gooey was sold & now lives in Dauphin,Mb. 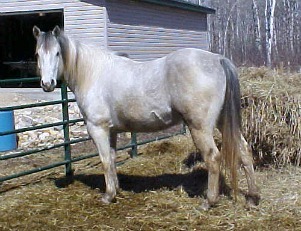 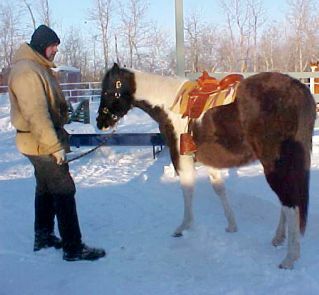 Kaluha a 2000 unregistered 3/4 Chestnut Roan Welsh Pony mare that i rescued at 5 1/2 months old in the begining of february 2001-which was a very cold february at that!! 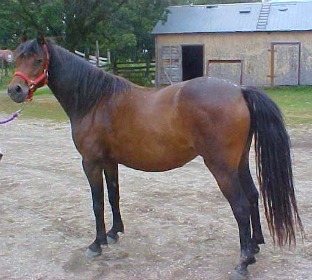 She was not halter broke and was still on her mom and wanted no part of being loaded into a horse trailer,it was interesting to say the least as the owner wasn't to happy she was going-that's another story all together.We still had Arabians & I had intended to breed her to my then arabian stallion Rahja as he was on the smaller side and I thought the cross would be nice.The long & short of is i never did breed her to Rahja and after I sold him I kept her around a while as she was so cute and charming. 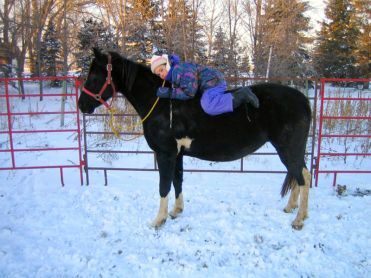 We would put kids on her to be lead around and let none horse people giggle like children when she'd put her nose in the air for a kiss.Kaluha is now happily living with a couple of our friends where she is still a favorite of kids & adults.She had one foal a few years back by their welsh/arabian cross stud which was a very nice filly that is a carbon copy of her only taller & she still put's her nose up for those kisses!! 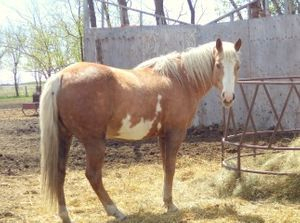 Kahlua was sold & now lives outside of Anola,Mb. 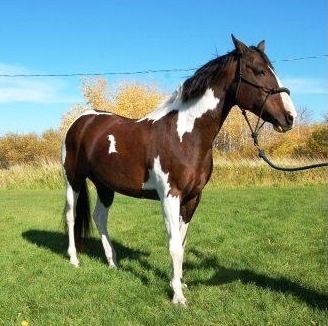 Big Time Pine APHA #779,328-2004 Black Tobiano Mare by Fritz Leo Pine (QH) x Big Time Dial.Cheyanne was a very sweet kind mare,she became blind at 5 years old and was always quiet and sensible to deal with.Her foals inhereited her wonderful disposition and common sense,they were all easy to halter break and handle.They seemed to know their mom had an impairment and seemed to look after her and in away were her eyes.Due to the fact she was blind,she often walked into or over things,we always had her in pens that were what we called foal safe so she wouldn't get hurt or only minor if she spooked or walked into something.She was in with no more than 2 horses at a time and was fairly high up in the pecking order and was often the boss of her herd mates,our stallion Spike was good with her and like his foals seemed to know she was blind.Unfortunately sometimes horses like people just die and sometimes for no apparent reason.We will never own a horse as quiet and sensible as she was and have no plans on replacing her as there isn't a horse on earth that could. 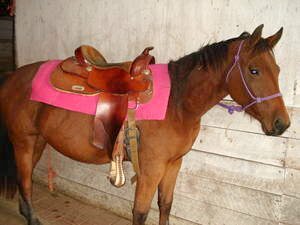 2004-2016 Rest Easy Cheyanne. 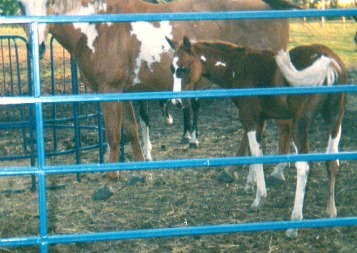 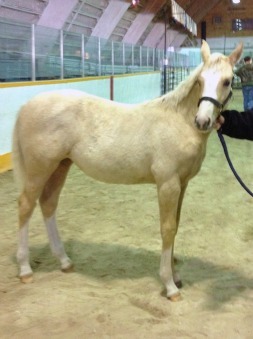 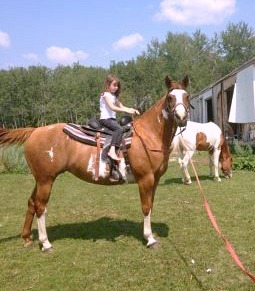 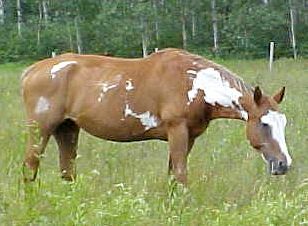 CL Imprinted Angel APHA # 760,874-2003 Sorrel Tobiano Mare by RH Mr.Imprint x Miss Sundays Kid Clu.This was my once in a life time horse.She was well bred,fantastic to look at easy to deal with and I was fortunate enough to get 5 foals from her.This mare was shown when she was still in the U.S,she was a 2 time reserve grand champion and ROM halter mare with 18 halter points earned and one register of merit.Her 2 foals in the U.S are also show horses.She developed an arthritic knee a few years back that just kept getting worse every year to the point where it was completely bowed.Needless to say it made moving around difficult and made quality of life lessen.The hard choice was made to humanely put her down as we had done all that we could to make her comfortable.I will never own another horse of her caliber and glad I had her for 8 years.2003-2018 Rest In peace Halo I hope where ever you are your running with your tail up and snorting. 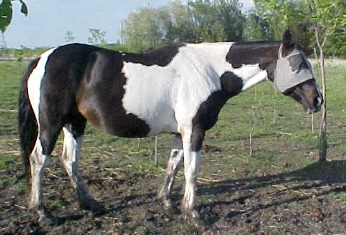 All rights reserved by Hopeful Farm Paints.